1. Place beef and bacon into a large mixing bowl and season with salt and pepper. Mix together until fully combined. 2. Form six equal patties and place in the refrigerator between parchment to chill. 3. Heat a grill pan over medium-high heat and brush the surface with vegetable oil. 4. Place patties onto the grill pan (three at a time) and grill for 5 to 7 minute on each side. 5. 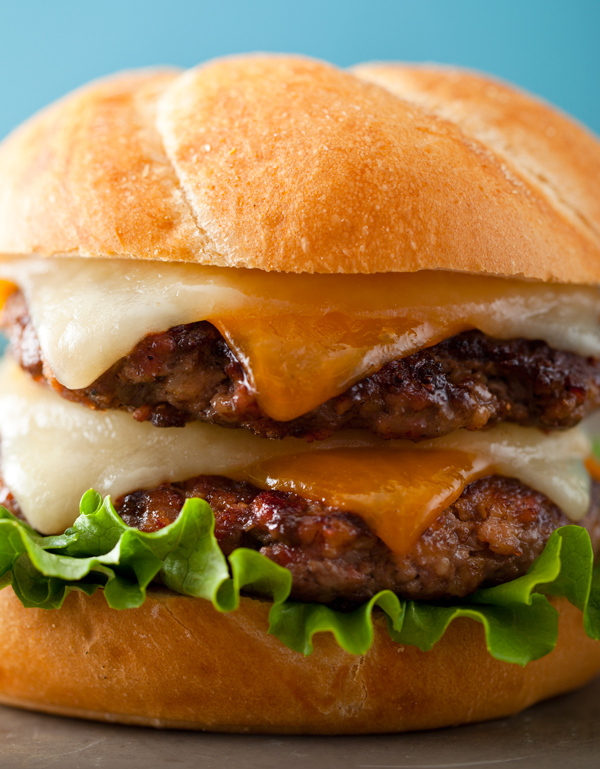 About two minutes before the patties are done, place a piece of cheddar and jack cheese over each patty and allow cheese to melt before removing and placing onto a clean surface. Repeat with the remaining patties and cheese. 6. To assemble: Stack two patties onto one another and place on a bun. Add any remaining toppings and condiments of your choice and serve. Thanks for the recip. My son loves hamburgers(monster burgers)! !